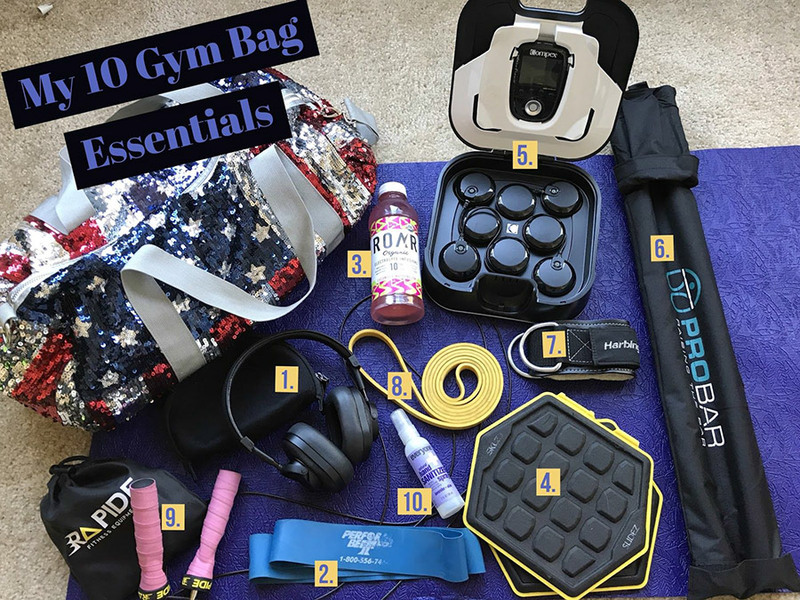 Everyone has their “go-to’s” in the gym, I want to share a few of my absolute favorite things. My Master & Dynamic Headphones: I like to zone out to my own music in the gym. These headphones let everyone know, NOT to bother me. Master & Dynamic is my favorite brand, because they’re high quality & chic. Mini Bands or as the “booty crazed” world calls them “Booty Bands”: I prefer the Perform Better bands (they tend to break less than other brands that I’ve tried). Roar Organic: It’s my ABSOLUTE favorite new electrolyte hydration drink that is coconut water based, and it’s infused with vitamins. 10 calories per serving, NO GMO’S, only 2 grams of organic sugar which is significantly less sugar than other hydration drinks, and it tastes AMAZING!! My favorite flavors are Mango Clementine & Cucumber Watermelon. Skillz Sliders: You can add these to most workouts to progress them. My Compex Muscle Stimulator: This Bluetooth Version is the TOPS! I can use this compex, as a warm up, to increase muscle strength, & to recover. It’s a one stop shop! The Bluetooth makes it easier to workout without the chords. My ProBar: This bar looks pretty simple, but don’t let it fool you…It’s a bar based mobility system, which really helps to correct poor movement patterns…It’s super easy to travel with, and I use it for myself, and my clients. Harbinger Heavy Duty Ankle Cuff: I really don’t like using the cuffs at the gym, because I’m not sure how well they sanitize them (if they ever do). So I love these because they assist w/ many exercises I do involving the cable machine. Skillz Pro Band: This band has so many benefits, which you’ll see in a future blog. Rapide Jump Rope: I like skipping rope, it’s a great cardio exercise. This jump rope has colorful anti-slip handles & adjustable cables for size. Everyone Natural Hand Sanitizer: Because most people have cooties, and they spread them on every piece of equipment and it kind of grosses me out. Sugar, Buzz Words, Weight Loss & You!